This morning is the first morning I feel well enough to write, after a week of mornings where the fever caused my bones and muscles to crumble under flu aches, and I despaired wondering if I would ever be able to breathe through my nose again. After a week of days where I was rendered barely able to move, let alone clean my house, I was well enough this morning to survey the damage, and realized how depressing the cycle of being sick actually is. When one feels lousy, the cleaning and dusting goes undone, the clutter piles up (somehow!) and everything is kissed by a not-so-thin layer of dust and dog hair. Which makes one feel even lousier. Thus, the vicious catch-22 of the flu. This morning, with a renewed frenzied energy bordering on frantic, I tackled the cycle. Eradicating every last residual influenza germ being the ultimate goal, I scoured and dusted and vacuumed for awhile before taking stock of my writing desk. Covered in bric-a-brac, unopened mail from two weeks ago, and the shuffle of papers and notes from my various writing projects, it was overwhelming. There is little wonder I’d been avoiding it, even in the days prior to my bout with the flu. 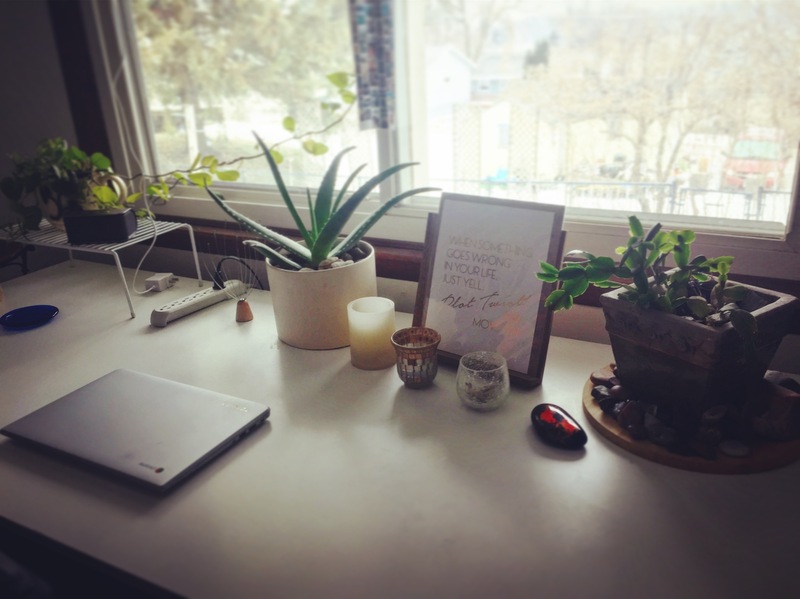 But this desk was the center of my writing world: where every scene I dreamed up in the shower or plot knot I untangled in the car (hands-free dictation apps, look ’em up!) was documented, flushed out, put to (digital) paper. It is a white workbench-style table, with a solid metal base and an expansive rectangular surface made from hefty particle board with a white laminate overlay. Basic, plain. Utilitarian. A fresh, clean palette. And so, of course, my first instinct was to cover it with decoration: hand-painted yarn bowls, framed pictures, glass mosaic-tiled vases. Decoration eventually gave way to things: folders, notebooks, pens, more notebooks, fresh stacks of unused post-it pads, post-it notes with various scribbles. Seashells. Business cards. Coffee mugs. And books… so many books. Stacks of books. Four-fifths of the desk surface was books. Today I made a decision: over the past several weeks, and even months, I had been gradually avoiding my workstation because it no longer was conducive to its original purpose… writing. Every time I sat down, I was distracted by things. And the words would slow, and stop. And so I would gravitate to my couch, which of course offered its own set of distractions in the form of the TV remote. Or my bed… which I will posit is a terrible, terrible place to try to write a novel. Or outdoors… this option actually works brilliantly in warmer months, but not so much in January in Minnesota. This flu hiatus acted as a reset; I needed to clear the space, so that the words could come again. Three live plants, one set in the midst of a mini rock garden to add some texture and sparkle. 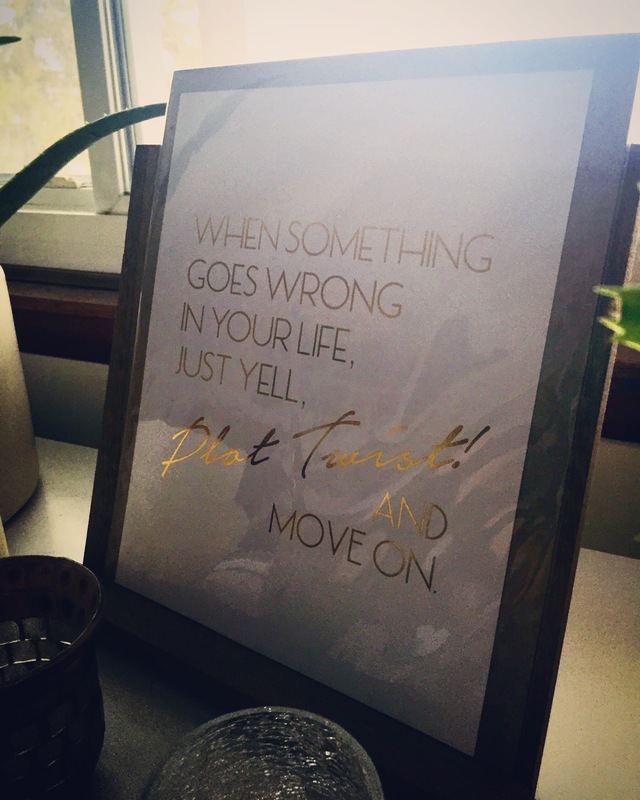 An artsy poster of text, made by a friend of mine, with an inspirational quote in gold foil print. Three candles: two battery-operated faux candles that give off a gentle warm light, one real scented candle designed to fill the space with the warm fragrance of Snicker-doodle cookies. A hand-painted paperweight I picked up in Tanzania, a polished black stone covered in dainty goldfish. An antique coaster, made from blue hand-blown glass. A head massager (a must-have within arm’s reach, trust me). A crackle-glass votive, full of dried French lavender from my garden. Lastly, my laptop. And then, reader, the words did come back. Because now I’m sitting here, at my desk, telling you all about it. The lovely end result. No, there is no “before” picture (thank goodness). Yes, you just read a blog post about how I cleaned my apartment (sorry). But it’s also about how we really should be intentional about honoring the importance of where we write. If we do not allow ourselves the adequate environment in which inspiration and ideas can flourish, we aren’t allowing ourselves the chance to achieve what we want through our writing. This applies equally to creators of art in other mediums, and it all goes back to self-care… as creators we can easily become caught up in the act of creating, and neglect other supportive aspects of sustaining our creative drive. Finding a space that nurtures your craft and sparks your creativity is step one; nurturing that space as well as your craft and creativity is the critical step two. Take care of your space. Take care of you. And the words will come. I Made a Book Trailer! Today I discovered a magical little app called Adobe Spark. Not bad for an amateur, hmmm? I think book trailers are awesome, and let me explain why. Most of my followers who are also writers probably already know what a book trailer is… but for the folks who’d like that information, a book trailer is a simple way to bring your story (or even a mere snapshot of your story) to life, to have it jump off the page and delight the eyes of your audience through the use of a different medium. Why make a book trailer, you ask? As a whole, in this Digital Age, we are more attracted to video and visual cues than ever before, as we are constantly bombarded by visual information whenever we hop on Google. As a marketer in this Digital Age, you cater to the needs of an increasingly visual audience; you gravitate toward bright and interesting photography and snappy video as effective means to market your product, because those media have higher consumption rates among audiences (compared to a page-long summary or written advertisement). This concept very much applies to book marketing. Authors increasingly are relying on visual messaging to boost their work, and news of their work, to their readers. Many folks in all niches of the book community… authors, reviewers, publishers, etc. … have turned to vlogs (the video blog). It makes sense. If I, a reader, can click on links and see videos of my favorite authors talking about their upcoming projects, I get a sense of immediacy from seeing their faces and a greater connection to their words by hearing them spoken. My Stormriders book trailer is really a teaser trailer, very much a snapshot. It’s a little rough (hey, I’m new at this!) but I’m excited to bring my heroine’s voice to you. My primary motivation for creating the trailer is because I haven’t yet given her voice a chance to be heard… she does not speak at all in the the first four chapters that are currently available to the public. Since Stormriders is quintessentially her story, I wanted to create something that hinted at the events to come, through her eyes. The art of being happily alone, a “Stormriders” update, and some other miscellany. No Internets mean much writings. A solo weekend getaway would usually be considered an odd choice for me. I like people, generally. However, being bombarded with so many distractions (of political and sporting nature) this summer has not been conducive to fulfilling my commitments as a writer, and to myself. The distractions add up. With all the negativity and stress hanging around society lately, a weekend away from humans (physically and digitally) sounded like a phenomenal plan. An uncle owns a gorgeous piece of land on Little Alden Lake, a stone’s throw northwest of Duluth. And so, last weekend I ventured into the Great Northern Wild Pine Forests of Minnesota, with only my dog Layla (with the very real title of Bear Scarer bestowed upon her) in tow, and with the very real intention of disappearing from the rest of humanity for 72 hours. Minimum. Twenty-five minutes outside the city, and the pavement turns to dirt and gravel. The forest presses in on you as you take the winding road, which you begin to think is taking you into the bowels of a forest purgatory, or toward some hidden backwoods colony of survivalists; you try to ignore the banjos playing the theme from “Deliverance” in your head. You shouldn’t have started the journey after sunset… what were you thinking? The moment when you are absolutely, hysterically certain you have lost your way and your fate is to be eaten by the bears, you are there. Ahead lies a little idyll of certainty in the heart of darkness. An A-frame cabin and a few outbuildings nestle between fully grown pines that soar into the black overhead. A precariously handmade stairway of stones create a path down a shaded slope to the lake. The property is surrounded by a thick ring of pine trees and underbrush, muffling the presence of the few neighbors who live there year round. You turn off the ignition and are immediately aware of the utter absence of sound. The nocturnal creepy-crawlies, momentarily disturbed by the intrusion of bright car headlights, have fallen silent. You look up, and as your eyes adjust, you see the blackness has dissolved into a cacophony of the brightest stars you have ever seen. You could swear they are only a few inches from your face, for how bright and clear they are. Your dog’s low, uneasy growl snaps you back to earth. She stares intently beyond the circle of light from your high beams, as if she can sense something out there, waiting beyond the trees. And, then out of nowhere, the unearthly shriek of a loon warbles up from the water, echoing through the trees. Your heart jumps into your throat. You run inside. You will unpack tomorrow. You may be thinking I was thinking I’d made a big mistake. Nothing could be further from the truth. Being utterly alone for those three days was exactly what I needed. Some people call it recharging their batteries. I call it an exercise in focus. Nature + wine = happy tingles. Thanks, Science. Aside from the massive amounts of writing I was able to accomplish in the massive void left behind by the Internet, there are several moments from the weekend I can pinpoint, where I was not doing a whole lot. Waking with the morning and walking out onto the deck that faces the lake, watching Layla chase frogs in the grass, feeling the sun’s warm kiss on my skin, drinking in the scenery with my coffee, merely thinking about my novel… and I would feel this strange tingly buzz that started somewhere under my ribs and spread through my arms and legs, to my fingers and toes, flowing up my spine and prickling across my scalp. I don’t know if there’s a word that can accurately explain that feeling (“Endorphins?” asks Science), but maybe I’ll call it the body’s reaction to the brain’s realization of pure and utter joy. Contentment. Confidence in the knowledge that when I did sit down to write, I would write and write and write. I was so happy I was tingly. Everyone should be able to feel that feeling. So, I say, seek out the places that make you tingly. Take a break from the places that squeeze, that apply pressure, that weigh down, that pull apart. Unplug. Be by yourself for a weekend, a day, an hour even. Give yourself the space to rest, “recharge,” refocus. Let your senses take in the small things in those moments. The fluid sparkle of sunlight on the water. The surprising complexity of loon song. The squelch of mud between your toes. The hilarity of a hound dog learning what a frog feels like in her mouth (the frog survived). The late summer wind that already has a crisp bite to it, hinting of an early autumn. On a tree branch of a thousand green leaves, espying the one with a reddish tinge. How the wine in your glass tastes different as you breathe in the scent of fresh pine. Allow yourself the pleasure of being alone. During my voluntary absence from human contact, I was able to complete the next chapter in “Stormriders.” For more information about the story, and to read the first 4 chapters free, you can visit my Stormriders page. While some of my other writing projects have taken a backseat to Stormriders (I’m only human, and just one!) I am still incrementally moving them forward. My Tanzania travel memoir survived its second edit, and I’m working on the specifics for getting that out into the world. Namely, to Amazon.com or not to Amazon.com. I would be appreciative of any feedback from my fellow indie authors, regarding alternative print-on-demand and e-book vendors. Which vendors are your favorites? What as worked for you, and what hasn’t? I’ve also got a few short story ideas in my head that I will undoubtedly make available for free here, on my site, in the near future. More on that down the road! Creating a new dialect ain’t easy. During my worldbuilding endeavors for my serial novel, Stormriders, I discovered that some of the people who lived in the World I Built spoke an interesting hodge-podge creole of Appalachian English and Pirate English vernacular. Interesting, but tricky. I’d never created a dialect before. Luckily, I have been able to research to my heart’s content because The Interwebs. And what I’m finding is fascinating! I’ve learned that there are dictionaries, encyclopedias, and other reference materials out there for just about every language that exists or has ever existed on the planet. And many of those are free! I’ve learned that Appalachian English remains the closest still-spoken dialect on earth to the language of Shakespeare (Hendrickson, 1997). I’ve learned that Pirate English is a dialect that is actually spoken by more real-life people today that I could have imagined. I’ve learned that creating a language, even a creole dialect of English language variations, is HARD. But as words fly out of my main character’s mouth and onto the pages of my story, it’s apparent how worthwhile the effort is. Language brings authenticity to the world you’ve created. World-building is one of the most enjoyable writing exercises for me. And why wouldn’t it be? Science fiction and fantasy authors the world over have created some of the most vibrant, beautiful worlds I’ve ever pictured inside my head via the words on their pages. And all of those worlds came replete with rich geographical, climatological, political, and cultural details. I’m no J.R.R. Tolkien. Inventing a brand new language from scratch (as Tolkien did multiple times for The Hobbit and The Lord of the Rings) is daunting in a way I can’t fully voice. Perhaps Tolkien felt similarly as he began wandering through the World He Built. Perhaps not… he was a philologist, after all. Thankfully, for the purposes of my story and the world I’ve built for Stormriders (which takes place in a post-apocalyptic former North America), I did not have to invent a new language from scratch. But for one group, the Shoalfolk of the Carolina Shoals (a string of low-lying islands and cays that formerly comprised the Appalachian highlands, before catastrophic flooding devastated the low-lying continental United States over millennia), it felt inappropriate to neglect to honor that rich culture that, to this current day, reflects the linguistic cadences and phrasing of Elizabethan English. In order for readers to believe in your characters, you have to be able to answer questions about every aspect of the world in which your characters were born, grew up, and have embarked upon their journeys. Language is one of those critical aspects (and I would argue, perhaps one of the most important), which can shape a culture and bring authenticity to your characters themselves, as they move through the world you’ve tirelessly imagined. And it’s a big, big world out there, indeed.